Over the weekend I took the family to Whitstable – it’s nearly the Centenary of Peter Cushing’s birth – and I was moved by the clear affection the town clearly has for their former resident and gentleman of the Hammer Horror movies (amongst his numerous other classic roles). I’d just started to group the photographs taken there with a view to posting them with a blog piece this evening when I received the sad news that another of my monster movie heroes and another true gentleman of the business had passed away. Ray Harryhausen’s influence on the movie world and beyond cannot be for a moment be considered anything other than spectacular. 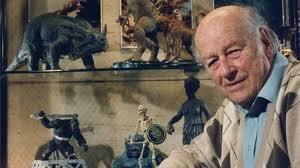 Through his retelling of classic mythology and science fiction tales through his skilled craftsmanship and sheer patience, to those other filmmakers he inspired to work and create in stop-motion and, later, animatronic and then cgi effects – Harryhausen’s stamp is clearly hammered down with the heavy foot of one of his dinosaurs into the history of filmmaking. 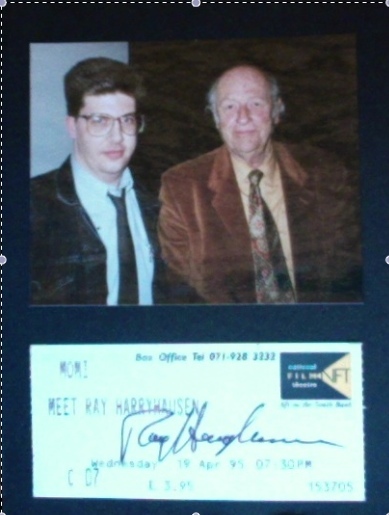 I felt very privileged to have had the opportunity to meet the great man and to see some of his work at close quarters, both when the British Film Institute hosted a retrospective of his work back in 1995 and at the ‘Hammer at Bray Studios’ event in 1998. A very sad loss to the world of fantasy cinema and artistry. Thank you for all of your movie magic, Sir.